What happens in intestinal epithelial cells during a chronic illness? Basic research conducted at the Chair of Nutrition and Immunology at the Technical University of Munich (TUM) addressed this question by generating a new model system. Functioning mitochondria play a decisive role in cellular homeostasis, but what happens when an important player of the anti-stress program in mitochondria is switched off? On the one hand, this leads to the loss of stem cells, but on the other, it sets healing processes in motion. The human intestinal system covers an area of approximately 300 to 500 square meters due to its many protrusions (villi). This inner intestinal wall full of tiny bumps renews itself completely once every four to five days, a process which is guided by stem cells. Mitochondria are the powerhouse of a cell and provide energy through respiration, and play a crucial part in this process. When the self-renewal of intestinal epithelial cells is interrupted, for example due to defective mitochondria, chronic inflammation may result under extreme conditions. "We then speak of cell stress," explains Professor Dirk Haller from the Chair of Nutrition and Immunology and Executive Director of the Institute for Food and Health (ZIEL) at the Technical University of Munich (TUM). If cell stress occurs, then – to put it graphically - helpers so called chaperones are activated to ensure that the proteins involved in the renewal process fold properly in cells in order to maintain homeostasis of the intestinal mucosa. Heat shock protein (HSP) 60 is one of these regulators and is essential to maintain the status quo in mitochondria of intestinal epithelial cells. In a study just published in Nature Communications by Haller and his team, this protein HSP60 was examined more closely. It is deeply involved in the unfolded protein response (UPR), as scientists call it – it can be understood as a component of the anti-stress program in cells. What happens when precisely this crucial regulator HSP60 is deactivated in the gut? How do mitochondria react in the cells when it is absent? On one hand, the respiratory capacity and the cellular ATP levels were reduced, both key tasks of the mitochondrion, the powerhouse of the cell. At the same time, Professor Haller and his team observed that all cells without HSP60 presented changes. Stem cells lost their ability to self-regenerate, while surrounding epithelial cells initiated a growth program. "But the reaction to the lack of HSP60 was startling", says Haller — "because although stem cells lost their characteristic properties, the stressed cells in the surrounding intestinal mucus wall activated a growth program leading first to hyperproliferation that finally ended in tissue regeneration." The cells with disrupted mitochondrial functions send out growth factors as a "call for help". Using the stress response program, they ensure that the residing stem cells with intact mitochondria divide abundantly; these new, intact cells then replace the other stressed ones. 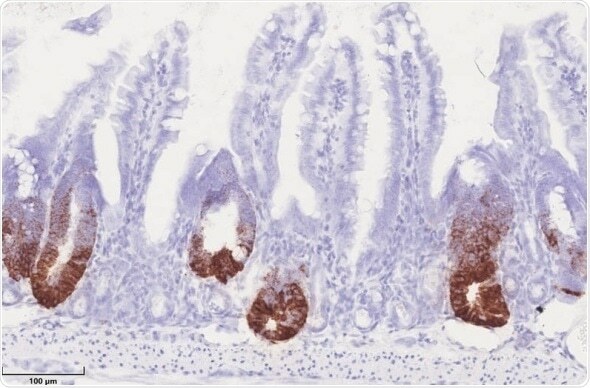 The lack of HSP60 therefore led to the establishment of communications from one cell to another, triggering a previously unknown healing mechanism which could be of significance after injuries to or inflammation of the intestine. "This shows what a fundamental role functioning mitochondria have in regulating intestinal tissue renewal and how they might contribute to chronic intestinal diseases", says Haller about the findings. Consequently, when the intestine is in a permanent inflammatory or stressed state, the stem cells are permanently over-stimulated to self-renew and this could facilitate the development of tumors.